As always on Oscar-nominations-announcement day, I have written a kind of “instant analysis” of the song and score categories — who was nominated, who was not, and a bit about the background of the nominees. 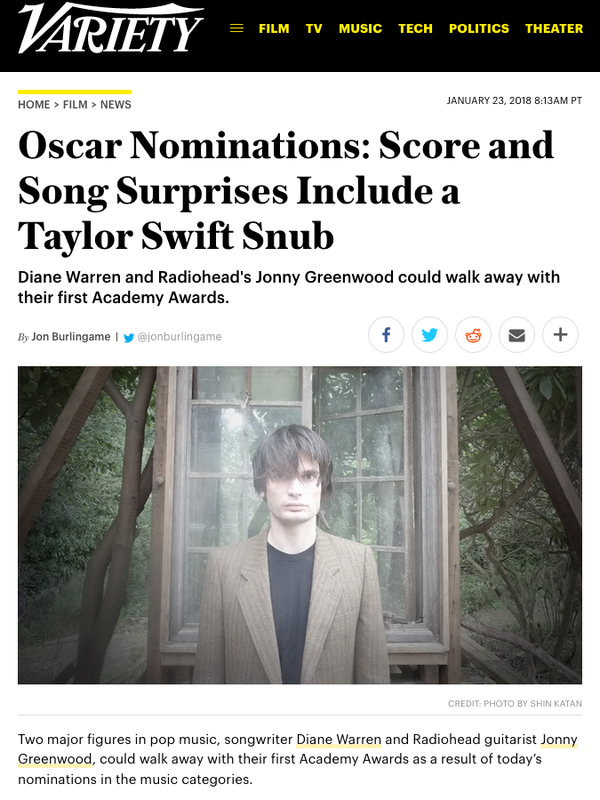 The lead of my story — the fact that two major pop names, Diane Warren and Jonny Greenwood — remained intact even though editors chose to highlight a “Taylor Swift snub” in the headline (something I have nothing to do with). But that’s about attracting readers to the story. 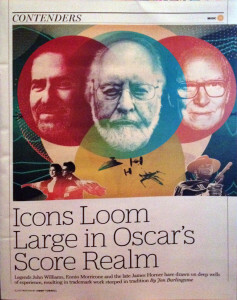 The story itself is solid and filled with data about John Williams’ 51 nominations, Greenwood’s past history with the Academy, Warren’s failure to win despite eight previous nods, and whose recent wins may be a factor in whether they win again. It’s on Variety‘s website today; I will be writing new stories on the topic for print over the next two weeks. 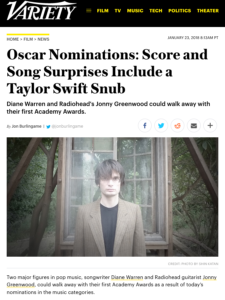 This entry was posted in Composers, Film Music and tagged 90th Academy Awards, Diane Warren, John Williams, Jonny Greenwood, Oscar music, Oscar music analysis, Variety on January 23, 2018 by Jon Burlingame. 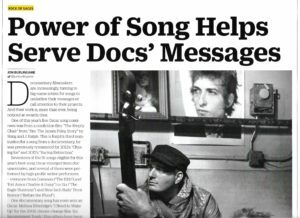 An astonishing number of major pop and rock artists are now contributing songs to documentaries. This year, nearly a fifth of all the songs entered for Oscar consideration came from non-fiction films, and some of those were written and/or performed by among the biggest names in music. For the lead story in this week’s special Variety Contenders issue, I interviewed several of those artists, including Sting (now Oscar-nominated with co-writer J. Ralph for a song in Jim: The James Foley Story), Tori Amos, Common, Trent Reznor and Diane Warren. This entry was posted in Composers, Film Music, Interviews and tagged Common, Diane Warren, documentary songs, J. Ralph, Oscar nominated songs, Sia, songs in documentaries, Sting, Tori Amos, Variety on February 7, 2017 by Jon Burlingame.